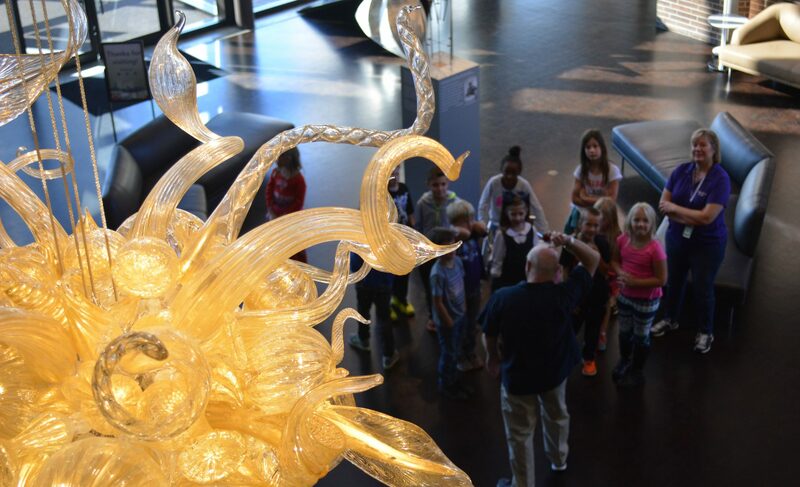 Goings: Joining me today is Darrell Petit, creator of FWMoA’s newest sculpture, Continuum. So Derrell, tell me about Continuum. What was your inspiration for the piece and how did it evolve? Petit: Continuum was created over the course of many years. It was started in 2000 and was completed here today in 2016. It’s something that Charles Shepard had seen when we got together about 5 years ago and we talked about somehow integrating it into FWMoA’s setting. That’s a little bit of the background on how it came to be here. Granite always involves a long period of labor which is separate from the quarrying. But, you know, in this case Continuum is a 16-year piece. The top surface is a wonderful undulating ribbon that is reflective of water, and shows the brilliance of the stony creek granite’s characteristically igneous flow structure. Darrell Petit, Continuum. Granite, 2015. Museum Purchase. Photographed by Katy Thompson. Goings: It’s going to look fantastic in the front courtyard with the reflective windows of the atrium. Continuum will get a lot of sunlight to highlight its features. Petit: Yes! What you just pointed out is the multiplicity of different views that we studied hard in order to come up with the right location for Continuum. Because it’s true—you come into the lobby, you look through a glass wall into the area where the sculpture is, which is your immediate view. But upon entering into the plaza itself you have different perspectives—now you’re outdoors with many different things around. We located this specifically so that a person walking into and out of the museum would have different experiences. The context is absolutely critical to the piece being able to dynamically interact with the space and engage a viewer. The different ways they could view and experience Continuum is key. “Experience” is a word that for me comes before seeing. I hope that you experience the work before you start to intellectually read it or understand it. Goings: Expanding on the importance of experience as initial interaction with your work, is this view a result of how your own work and career has developed, or were you influenced early on by other artists and how they view their own work? Petit: Well, I think it certainly has to do with your own experience. My own experiences with seeing and being in the presence of great work and those instances where I’m incredibly moved or transported through a great work of art is something that I’m very conscious of in making my own art. That my art doesn’t stand unto itself in a kind of sensory deprivation, but that it fully engages in the space that it’s installed in and dynamically interacts with viewers. So, my emphasis on “experience” stems from my experience around great works and my background, which is in landscape architecture in an urban context. Goings: Are there any specific works that have especially moved you upon seeing them? Petit: Well Louis Kahn for instance. It’s extraordinary to be on the museum grounds next to a Louis Kahn building here. Mark DiSuvero is another artist within your own context whose work I’ve been greatly influenced by. Fredrick Olmstead, the landscape architect of many green open spaces in America. Japanese stone gardens and their interspersed spaces have been really influential to me, and I think it’s wonderful that you have one of those on the museum premises as well. Goings: It seems as though granite is a very natural medium for you. Have you always worked, or do you always work with granite, or do you choose other stone as well? Petit: I work in granite, but that’s not to say that I wouldn’t work in other stone. But at this point granite really fulfills the expectations that I look for in a material to create art. I’ve just recently gone on a trip to the Carrara white marble quarries to investigate it, but I have no experience with it. I’m primarily working in granite for its hardness, its durability, the wonderful resistance it offers, and all of the quarrying techniques that are somehow the most natural way in which I’m interacting at this point. Goings: When you work on one of your sculptures do you already know what you want to create at the beginning, or do you let it evolve in its own way as you work on it? My background is in art history, so whenever I see a sculpture on a large scale, such as Continuum, it always calls to mind Michelangelo and how he believed all of his works were already held within the stone, and it was just his job to set them free. I guess what I’m asking is, do you approach your work with the same frame of mind? Petit: I think the difference between me and many other sculptors who work in my medium is that I’m very invested, but I’m also able to start at the level of the quarry to secure the shapes I’m working with. I think Michelangelo worked that way as well. But my experience is that at that level it’s really about the origin of things, and to me that really involves a great degree of the work itself—seeing the shape in the natural formation and seeing it in between the beds and seams—these are the natural fissures in the formation. So ideally, starting the process of shaping and quarrying and sculpting at that point. And so that’s different. I think typically or traditionally a sculptor would start with a rectilinear Euclidean shaped block and begin to carve. Michelangelo’s statement about revealing what was already there has some truth to it. In fact I’m working with the material in at 1:1 relationship, so it’s an alive material. I’m not trying to dominate it or dictate it or control it totally, but I’m able to work with it in such a way that it becomes really what it’s supposed to be. And then it leads into the question of the non finito works that are really truly profound and sublime. There really is that aspect in my work that while I’m working I realize that the sculpture really has its own life. I arrive at a point with the sculpture where it’s looking back at me, or it has a life, certainly as important as yours. And it’s important to stop and not go further to a point where you need to dictate some control over it, because that’s when you lose it. Those are important moments to be highly conscious of. But that’s the quest, always, when is it finished and when is it not? Goings: So when you go to the quarry and begin each piece, are there blocks of stone that have already been quarried and cut for you, or do you look at the fissures and decide what piece you want to take out? Also, how long have you been connected with your current quarry? Petit: I’ve been involved since 1989, and I’m a partner in its operation at this point. The quarry operation is mostly looking for rectilinear raw blocks. I, as a sculptor, am looking for asymmetrical abnormalities, aberrations really, because these are the pieces that I like to work with. So mostly we’re going into the quarry, and in the process of the operation of quarrying blocks I’m able to collaborate with them at that early stage to go after areas in the formation that are not particularly interesting for an operation looking for square shapes. It’s a matter of timing, it’s a matter of collaborating within an existing process, and it’s a matter of knowing enough now to be able to do it in a collaborative way rather than a way in which somebody is ordering someone else. Goings: I just have one more question for you. Where would you say you fit in the realm of Minimalistic sculpture? Looking at Continuum, I see elements of Naturalism and organic movement, but it’s still quite beautifully minimal and self-contained. So where do you see yourself within this realm of Minimalism, or do you see yourself as part of a different school of art? Petit: Well, if you’re asking about the period in the 1970’s of Minimalist art in this country, then I certainly see myself as an extension of what those people were trying to achieve. It’s hard to see yourself as part of what was really a decade-long period, because there’s another period after that, and I see myself in a more protracted period of time, and my relationship with the past and the future. But there were sculptors there that were dealing with process, and the process being as or even more important than the actual finished work, and it being read in a way that its physical phenomena could be perceived or experienced. There are certain concepts there that I think are alive and valid, and I do see myself as being influence by some of those works and that period. But I am working today and in a way that is perhaps not so locked within the parameters of that stylistic period. Come visit FWMoA to view Petit’s sculpture, and our other sculptures around the museum, Tuesday-Sunday!